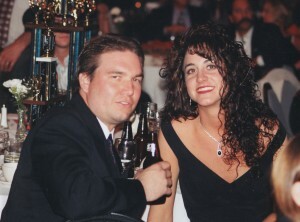 We met in the winter of 1996-1997 during the ESPN2 Winter Heat Late Model Racing Series held at Tucson Raceway Park. After the last race, Scott & I were walking across the infield together back to the “pits”. Scott was the Crew Chief for Marc Groskreutz, who had just finished 2nd behind my “Papas” in the Championship. As we chatted walking across the track that day, I never thought I would see him again. 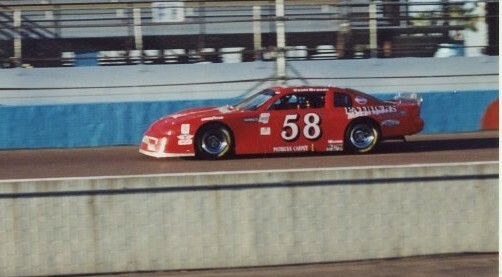 Little did I know, Scott was later offered a Super Late Model Stock Car “ride” by Patrick’s Motorsport’s and he moved to Tucson the following spring of 1997. Mutual friends encouraged me to call him, he only knew a few people in Tucson and they thought we would hit it off. After a bit of coaxing, I called and we met up at Hooters for wings and beers… I add this because truly, I never thought it would go anywhere, and anyone serious wouldn’t really go on their first date to Hooters! Would they??? The rest is history, we married in April of 2001. 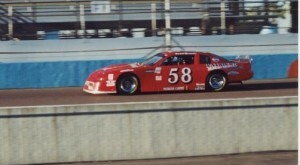 Scott raced Super Late Models & the NASCAR Southwest Tour Series in those years. When we had Madison in June of 2002, we traveled with a Late Model Stock Car to race in Montana’s biggest race of the year, The Montana 200, held at Montana Raceway Park. It had been our third trip up to race in the big event, and Scott came close to winning that year until an electrical fire took us out in the end. It was a long tough trip and in the end we both knew Montana was calling us home. It was a difficult decision for Scott to leave behind a racing career, and for me to leave my family in Tucson. In the years since, Scott has crawled behind the wheel of a Late Model Race car, a handful of times, leaving the drivers seat with a win under his belt in the Canadian-American Shoot-Out at Montana Raceway Park in 2004. He spent almost 6 years as the Crew Chief for local race car driver, Mark Owens. In their years together, they had 1 Championship, 2 handfuls of wins and numerous fast times. Racing continues to play a major role in our life, and how lucky Scott is to be able to make a career doing something he is so passionate about. Scott is currently working with Giles Thornton, an up and coming NASCAR racer who calls Whitefish, MT his home. When we met Giles a few years ago, Scott saw something in him that not a lot of others did and he built him his first Late Model Stock Car. Giles Thornton is racing a full schedule of the NASCAR K & N Series, and selected Late Model Shows in Montana, Idaho & Washington. I know there will be some good racing in the months ahead, and that Giles will be one to watch! Scott was talking with Madison, our oldest daughter, Saturday night as we were watching the NASCAR All Star Shoot Out on T.V. He told her that one day we will be watching Giles in that race, and there is no doubt in my mind that we will!